Our Friends of the Library will be having their next book sale on Saturday, Oct. 27 from 9:30 a.m. to 1:30 p.m. Stock up on your fall reading material at this well-priced book extravaganza! Please be aware that all San Diego Public Library locations will be closed on Thursday, Oct. 11 for our biennial Staff Development day. All library staff will spend the day learning about ways to improve our outreach efforts, merchandising our collections and team building. Your improved staff will return to work on Friday, Oct. 12 at our regular hours. Our book group will be reading Agatha Christie’s “Endless Night” this month. This title, published in 1968, was heralded as “a perfect evening’s entertainment for all ages” by the Kirkus Review. All are welcome to join the discussion on Tuesday, Oct. 9 at 1 p.m. Copies of the book are available for check out at the front desk. Our library is very fortunate to be hosting two community celebrity artists for the month of October. Stop in to take a look at George’s interpretive paintings and 4-year-old Carmen’s sensory art works. The works of George and Carmen will be on display throughout the month and an artists’ reception will be held on Friday, Oct. 12 at 11 a.m. All are welcome to attend! 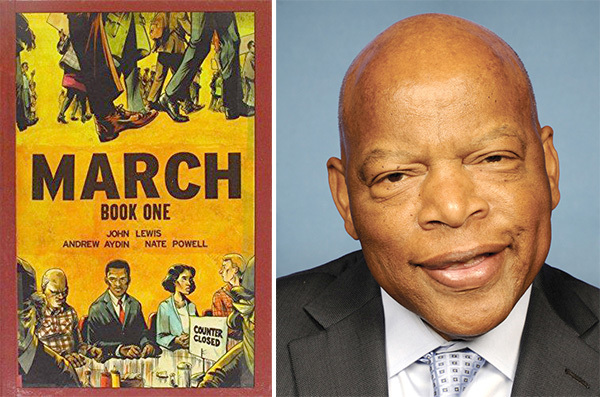 Drum roll, please … We are very excited that John Lewis’ “March: Book One” has been selected for this year’s One Book/One San Diego! This graphic novel, created in collaboration with Andrew Aydin and Nate Powell, details John Lewis’ experiences as a youth in rural Alabama and his involvement with the civil rights movement, as well as the Nashville Student Movement. Whether you are a graphic novel aficionado or have yet to read a graphic novel, we highly recommend that you read this title and join in the conversation. All 36 library locations will host programming related to the book and our branch is celebrating with a tween book club and interactive display. For more information, visit bit.ly/2oMUa7Y. On Tuesday, Oct. 9, we encourage all who eat vegan or just love salads to join us for a salad dressing program. In this class, we will make several simple, yet delicious salad dressings to bring your salads to life. This program will take place at 6 p.m. and is free to attend. Whether you are a professional artist or intimated by the thought of a blank page, Zentangle is the perfect way to explore your creativity. This easy to learn art method will have you creating beautiful images in no time. This program is geared toward adults and will take place on Friday, Oct. 12 at 2 p.m.
Our amazing fitness fun instructor will be taking the month off. Please check with the library toward the end of the month for information on November Fitness Fun programs. Has your name or address changed since the last election? Do you still need to register to vote? If so, stop into the library for a voter registration form. The deadline to mail in registration is Oct. 22. Interesting fact, youth can pre-register at age 16 so they will be eligible to vote once they turn 18. —Kathryn Jonson is managing librarian of the Allied Gardens-Benjamin Brach Library. Reach her at johnsonka@sandiego.gov.